New Zealand offers unparelleled variety. 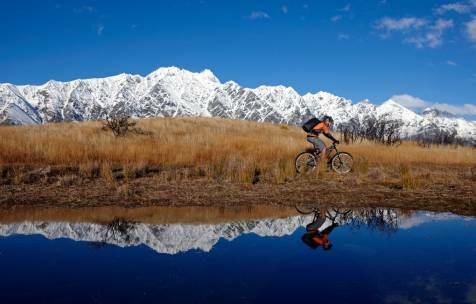 In the south: rugged snowy alps, dense native bush and plains. After a ferry crossing through the beautiful Marlborough Sounds, explore the north, with its busy cities, green pastures, mud pools and volcanoes. You'll need to be moderately fit to cycle distances up to 65 km daily. There's 740 km total biking, but you're welcome to ride in the support vehicle whenever you wish. We meet at the hotel in the early afternoon. Tour members arriving today will be transferred from the airport to the accommodation. Later this afternoon we'll go for a short drive up the Port Hills to the Sign of the Kiwi, a historic stone house with awesome views across the Canterbury Plains to the Southern Alps. The fittings for hired bikes will also be completed this afternoon. There are no meals provided on tour, but you may choose to contribute to a group kitty for the occasional breakfast and many picnic lunches. We leave Christchurch in good time and drive across the Canterbury plains through the inland rural towns of Ashburton, Geraldine and Fairlie. From here the road climbs 709 m to Burkes Pass, the northern entrance to the MacKenzie Country, an intermontane basin. 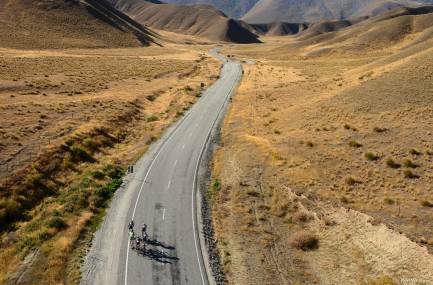 The area is famous for its wild landscapes, merino sheep and hydro-electric lake system. 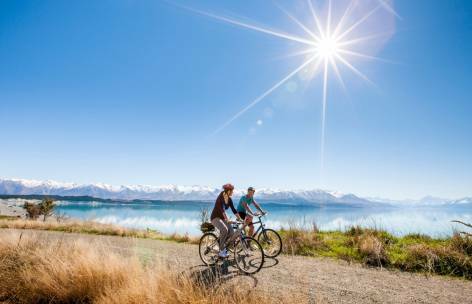 After lunch and a short drive from scenic Tekapo, we cycle a quiet canal road to Lake PÅ«kakÄ« and Twizel. On a clear day, enjoy glorious views of New Zealand's highest mountain, Aoraki Mt Cook (Aoraki means 'cloud piercer'). Ride in the support van by the High Country and right next to a Hobbit village. 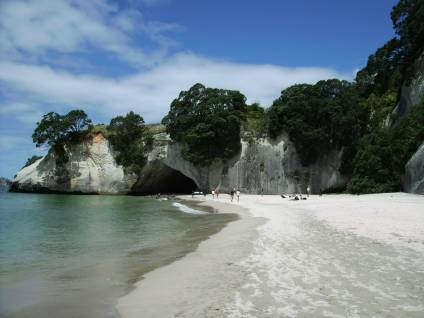 Scenes from Peter Jackson's movies were filmed here in 2012. You start the bike ride on the Vanished World Heritage Trail in the scenic hills and ride on quiet side roads to the Pacific Ocean. Thereafter in the van to the small fishing village of Moeraki where you visit the famous Moeraki Boulders. According to Maori tradition, the boulders are gourds and calabashes, washed from the great voyaging canoe Araiteuru when it was wrecked upon landfall in New Zealand some 1000 years ago. 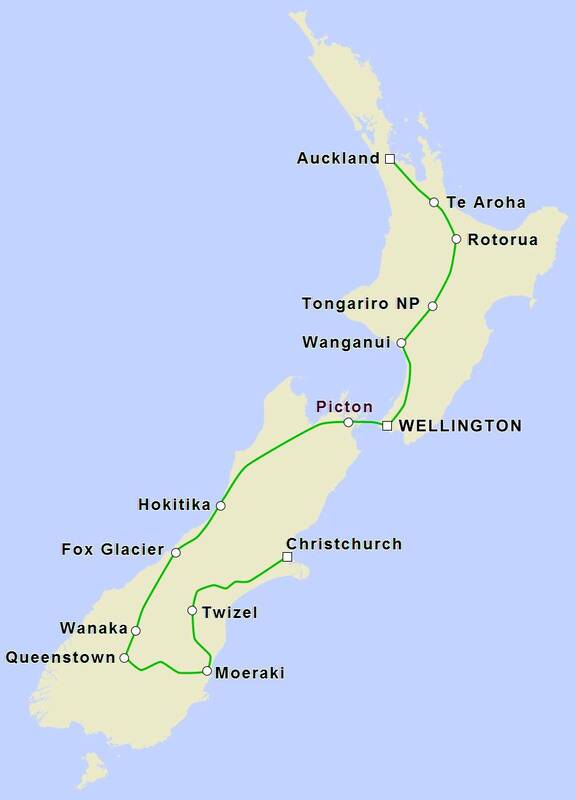 In the morning it's on the bus up to Macraes Flat, the largest active gold mine in New Zealand. Since 1990, 1.8 million ounces of gold have been obtained from the rock. From the vantage point you can look directly into the gold mine. At an altitude of 500m, today is one of the most beautiful cycling areas, you journey down to the town of Hyde (20 km). From Hyde drive on a section of the Otago Rail Trail, a former railway line from Old Gold Rush times (1879), through tunnels and over bridges with spectacular views of the landscape of Central Otago (40 km light gravel surface). Alpine paradise Queenstown is like a big adventure playground. Your options for the day include a day trip to Milford Sound or Doubtful Sound in Fiordland. Local activities include shopping, a gondola ride to the Skyline restaurant and viewpoint, a steam boat trip on TSS Earnslaw with majestic views from Lake Wakatipu, jet boating on the Shotover River, bungy jumping, white water rafting, tandem paragliding, or visit to the Kiwi Birdlife Park to see New Zealand's national icon for real. 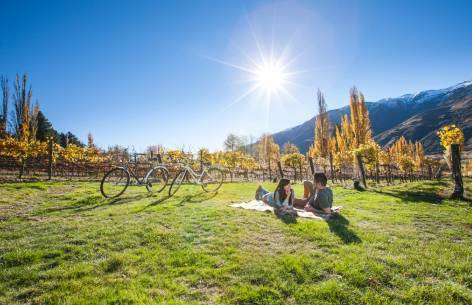 There's never a dull moment in vibrant Queenstown. Today we'll go on an early morning visit to spectacularly beautiful Arrowtown, an old gold mining town with tree lined streets and fascinating shops. This is followed by a challenging ride over the Crown Range. From the bike there is a great downhill into the Cardrona Valley. On your left you will pass the historic Cardrona Hotel, an iconic relic from gold prospecting days. 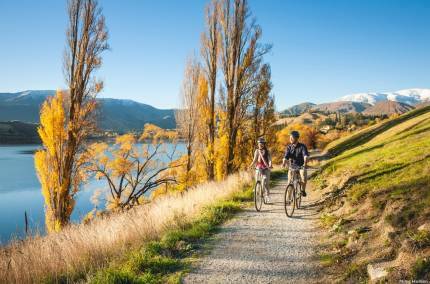 From there we cycle to the beautiful lakeside town of Wanaka. Today we drive west past Lakes Hawea and Wanaka, watching arid pastures give way to dense bush in Mt Aspiring National Park. 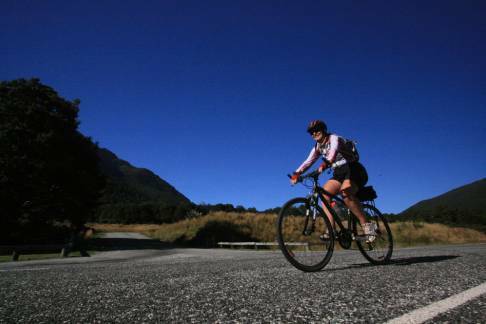 There, we bike from the Makarora Valley to Haast Pass (563 m). Then, a brief walk to the 30 m Thunder Creek Falls. We follow the Haast River to Haast village in Fiordland National Park, maybe stopping at the excellent visitor's centre. A spectacular snaking road takes us north through dense rainforest, over swift rivers and past 3 beautiful lakes. To our left: rugged coastline; to our right: massive alps. We finish with a short walk to the Fox Glacier face. This morning, perhaps take an optional helicopter flight to the glaciers (including landing). Or maybe walk around picturesque Lake Matheson, known as 'Mirror Lake'. Your guide will choose 1 of 2 cycling options, depending on weather. 1: Leaving Fox, ride through rainforest to Franz Josef Glacier and Ross township; then on to Hari Hari town. 2: From Lake Mahinapua ride to glacial Lake Kaniere, nestled in mountains and rainforest. Follow the shoreline on a gravel road and stop at a campsite for a picnic or swim. Then it's a pleasant 20 km ride to the town of Hokitika. In Greymouth you get on your bikes and cycle the spectacular coast road to the famous Pancake Rocks at Punakaiki (limestone formations that resemble well stacked pancakes).Here in the heart of the Paparoa NP we take a walk to the blowholes. They spout blasts of seawater out at high tide. Back on the bus leaving the West Coast through the Buller Gorge, via The Nelson Lakes National Park to Picton in the Marlborough Sounds. Should the weather be wet, we offer you an alternative route in the Wairau valley on the east side of the Alps and this is usually dry. Later we drive directly on to Picton to our accommodation. Today you have the entire day at your own leisure to explore Picton and the Queen Charlotte Sound â€“ Captain James Cookâ€™s favourite on his discovery journeys to Australia, New Zealand and the South Pacific. 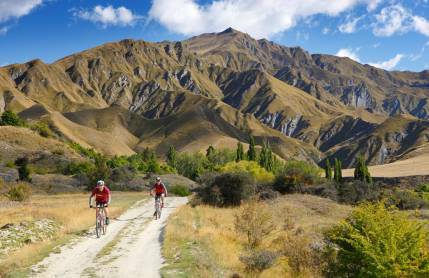 Some options include: A water taxi trip across the picturesque Marlborough Sounds, bike tour along the Kenepuru Panorama Route following the shore line of the Kenepuru Sound (from 40 - 120km), cycle tour to Blenheim (many vineyards in the Wairau Valley) and back 60km or a sea kayak tour. Today we take the ferry to New Zealandâ€™s capital Wellington on the North Island. 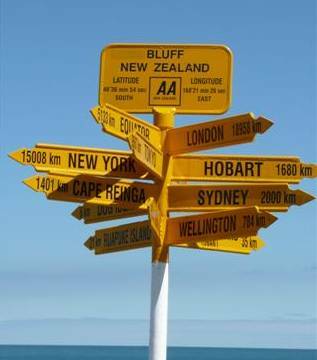 Enjoy the scenic views as you go through the Fjord like Queen Charlotte inlet, the Torry Channel and the Cook Strait. The afternoon is at leisure in Wellington. After a short sightseeing tour of vibrant 'Welly', you'll still have time to visit the famous Museum of New Zealand Te Papa Tongarewa, or enjoy panoramic views with a steep cable car ride from bustling Lambton Quay to the Botanic Gardens. Around lunchtime, we head north along State Highway 1 to Wanganui (sometimes called Whanganui), set on plains at the Whangaui river mouth. One of New Zealand's oldest towns, it is known for its beautiful gardens. Three volcanic peaks greet you as you approach Tongariro National Park - Mt Ruapehu, Mt Ngauruhoe and Mt Tongariro. 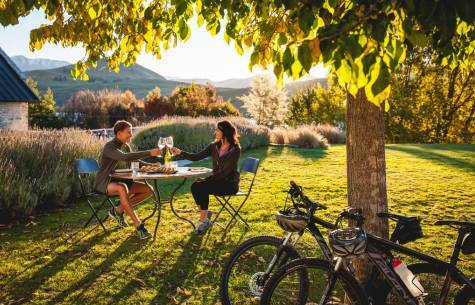 They seem to beckon you, as you bike along the Whanganui River to Kakatahi (57 km); or the Mangawhero river toward your nights destination in Whakapapa. This morning you cycle from Whakapapa along little Lake Rotoaira to Turangi on the shores of Lake TaupÅ. Lake TaupÅ was formed by a huge volcanic eruption around 135 AD. We continue driving down State Highway 1 to Rotorua, famous for its active wonderland of geysers, hot springs and boiling mud pools. This evening, why not enjoy a traditional MÄori concert and hÄngÄ« dinner (optional). HÄngÄ« are earth ovens where food is steamed over heated rocks, creating succulent, smoke-tinged flavours. Before leaving this famous geothermal area, we take you on a short city tour of Rotorua. The cycle leg today starts in Tapapa (or Te Poi for those wanting to cycle a few less kms) and takes you north alongside the Kaimai-Mamaku Forest Park to Te Aroha, nestled under Mt Te Aroha. The rest of the afternoon is free. Visit the natural hot pools, take a short walk to Mokena Geyser, or head to the visitor's centre to learn more about Te Aroha's gold mining history. This morning is at leisure allowing you to explore the small town, then the bus takes you down to the Gulf of Thames and on the coast road to Miranda (named after a British ship that arrived in the area in 1863). From there, we finish the cycling for this tour with a beautiful ride on an easy coastal road to the rural town of Clevedon, east of Auckland. After arriving in Auckland, we'll go on a sightseeing tour of New Zealandâ€™s largest city where you amongst other things will view the Harbour Bridge, Mt Eden, see the huge Marina and the Skytower. Today it's time to bid farewell after an amazing tour. If you're flying out of Auckland, we'll arrange for the transfers back to the airport to connect with your flight. Contact us today! Click here to email us your enquiry.